Although a potentially dangerous fall can happen at any age, individuals aged 65 and over are the most susceptible. In individuals over the age of 80, falls are the number one cause of death. The truth is, many falls that happen within the home could have been avoided by taking the appropriate preventative measures. Fall prevention programs can, therefore, save lives. Front door and other entrances – Install railings on both sides of steps, repair broken stairs or walkways and ensure adequate lighting. Living Room and bedrooms – If a piece of furniture acts as an obstacle, move it closer to the wall or remove it completely. 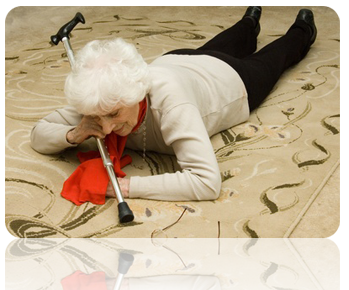 Install thick carpeting to help break a fall, should it occur, eliminate glass tables or other breakable items. Avoid tables with sharp edges, rounded corners are preferable. 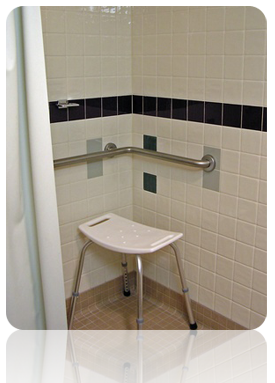 Bathroom – Install safety bars near the toilet, and in and around the bathtub or shower. Outdoors – Keep walkways clear of debris and weeds. Cords - Move cords away from high traffic areas, wrap any access, and attach extension cords securely to the wall. Flooring – Purchase non-slip rugs to counteract a smooth floor, particularly in the bathroom and kitchen, where contact with water becomes a cause for concern. Colors – Use colors to differentiate between various levels and fixtures. Highlight the edges of steps with a brighter color or choose a wall color that offsets the shade of fixtures. In addition to changes at home, exercise can also be a key tool in fighting off unnecessary falls. We specialize in the development of a well designed fall prevention program that addresses your needs. We can make recommendations to help preserve balance and avoid falls by designing a custom program that takes your individual capabilities and needs into consideration. As we grow older, we tend to become more set in our ways. Physical changes, especially the thought of exercise become daunting. Add the elements of fear, embarrassment and helplessness and the result is a dangerous susceptibility for lethal falls. It is our responsibility, as their family, friends, and healthcare providers - to help make their home a safe place to live. It is best to discuss any concerns with those involved before going ahead and making changes. A senior may not respond well to uninvited modifications, leaving the door open to refusal and scrutiny. Explain the importance of fall prevention with a gentle tone and genuine concern, instead of trying to impose your opinion. This is the best way to elicit a positive response, and implement a fall prevention program. » Prevention Can Save Your Life!! You don’t have to wait for a fall to happen in order to seek assistance from qualified professionals like us. 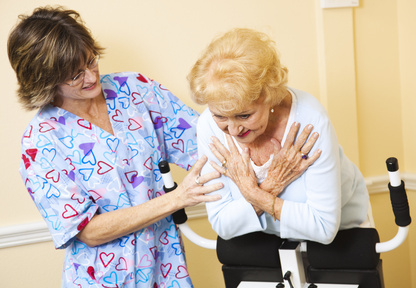 We are specially trained to provide help in a variety of aspects, including preventative measures against falls. We can recommend a series of exercises that address stability issues and encourage a safer environment. If you or someone you know is considered a “pack-rat”, it may be time to clean out the clutter. An overfilled house is a recipe for disaster because there are often pieces of furniture and items to walk around, possibly sparking a loss of balance. Do away with furniture and bulky items you no longer need, as a way of creating a free-flowing, obstacle-free living area. The longer you wait, the greater the opportunity for a fall to occur. Call us now and book an appointment to find out how to keep yourself or a loved one safe from a dangerous fall before it happens. It's time to save a life. "This is an outstanding product for chiropractors who wish to automate their marketing. As a chiropractor in the UK, I must say that such solutions are a welcome addition to clinics trying to juggle the demands of patient care and marketing at the same time, and I think Nitin and the staff at Chiropractic Newletter have done a sterling job in creating, delivering and offering customer support (Nitin personally called me twice to make sure I was able to maximise the user of the system). I would gladly recommend this to all chiropracters across the world"
Attend the free low back pain clinic! We, here at Family Chiropractic, welcome you to our low back seminar.